Acupuncture is one of the oldest, most commonly used systems of healing in the world. Originating in China some 3,500 years ago, only in the last three decades has it become popular in the United States Traditional Chinese medicine hold that there are as many as 2,000 acupuncture points on the human body, which are connected by 20 pathways (12 main, 8 secondary) called meridians. These meridians conduct energy, or qi (pronounced "chi"), between the surface of the body and its internal organs. Each point has a different effect on the qi that passes through it. Qi is believed to help regulate balance in the body. It is influenced by the opposing forces of yin and yang, which represent positive and negative energy and forces in the universe and human body. Acupuncture is believed to keep the balance between yin and yang, thus allowing for the normal flow of qi throughout the body and restoring health to the mind and body. When practiced by a trained acupuncturist, acupuncture is extremely safe. As a system of health care, acupuncture already has some inherent safeguards. Because the treatment is drug-free, patients do not have to worry about taking several doses of a medication or suffering a possible adverse reaction. Properly administered, acupuncture does no harm. However, there are certain conditions you should notify an acupuncturist about before undergoing treatment. If you have a pacemaker, for instance, you should not receive electroacupuncture due to the possibility of electromagnetic interference with the pacemaker. Similarly, if you tend to bleed or bruise easily, or if you are a haemophiliac, you may want to consider a different type of care. In the late 1970s, the World Health Organization recognized the ability of acupuncture and Oriental medicine to treat nearly four dozen common ailments, including neuro-musculoskeletal conditions (such as arthritis, neuralgia, insomnia, dizziness, and neck/shoulder pain); emotional and psychological disorders (such as depression and anxiety); circulatory disorders (such as hypertension, angina pectoris, arteriosclerosis and anaemia); addictions to alcohol, nicotine and other drugs; respiratory disorders (such as emphysema, sinusitis, allergies and bronchitis); and gastrointestinal conditions (such as food allergies, ulcers, chronic diarrhoea, constipation, indigestion, intestinal weakness, anorexia and gastritis). electroacupuncture is like traditional acupuncture in that the same points are stimulated during treatment. As with traditional acupuncture, needles are inserted on specific points along the body. The needles are then attached to a device that generates continuous electric pulses using small clips. These devices are used to adjust the frequency and intensity of the impulse being delivered, depending on the condition being treated. Electroacupuncture uses two needles at time so that the impulses can pass from one needle to the other. Several pairs of needles can be stimulated simultaneously, usually for no more than 30 minutes at a time. According to the principles of traditional Chinese medicine, illness is caused when qi does not flow properly throughout the body. Acupuncturists determine whether qi is weak, stagnant or otherwise out of balance, which indicates the points to be stimulated. Electroacupuncture is especially useful for conditions in which there is an accumulation of qi, such as in chronic pain syndromes or in cases where the qi is difficult to stimulate. It has been effectively used as a form of anaesthesia; as a pain reliever for muscle spasms; and a treatment for neurological disorders. Other studies have examined the role of electroacupuncture in treating skin conditions such as acne, renal colic, and acute nausea caused by cancer medications. There is also some evidence that electrical stimulation of acupuncture points activates the endorphin system, which could lower blood pressure and reduce heart disease. Patients may experience a tingling sensation while being treated with electroacupuncture, which is most likely due to the electric current. In most cases, however, the effect produced by the current is tingling sensation which in most cases will not be felt. 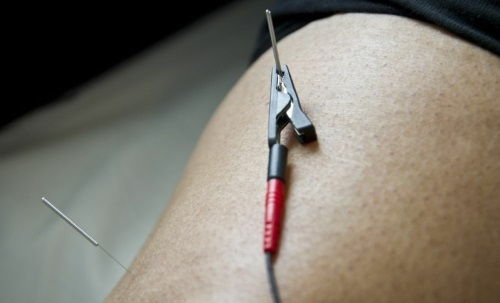 Electroacupuncture should not be used on patients who have a history of seizures, epilepsy, heart disease or strokes, or on patients with pacemakers. It should also not be performed on a patient's head or throat, or directly over the heart. Another recommendation is that when needles are being connected to an electric current, the current should not travel across the midline of the body (an imaginary line running from the bridge of the nose to the belly button). Auricular therapy integrates Western and Chinese theories of health as balance and equilibrium. Auricular therapy - (Ear acupuncture) - is a form of alternative medicine based on the idea that the ear is a microsystem, meaning that the entire body is represented on the auricle (or auricula, or pinna - the outer portion of the ear) in a similar fashion to reflexology and iridology and that the entire body can be treated by stimulation of the surface of the ear exclusively. The use of the ear is based on the rich and the multiple connections which it has on the central nervous system. The shape of the body is projected into the ear and every point of the body corresponds to a point of the ear. In a healthy person the link is not apparent but when there is an imbalance of the physiological equilibrium its point of projection in the ear becomes painful. The therapist then stimulates the painful points of the ear by massage or needling. What are the benefits of Auricular? Auriculotherapy became popular from being used successfully to treat patients for pain control, addictions, appetite control and smoking cessation. Sometimes auricular therapy is used with other modalities such as physical therapy, is also used in conjunction with body acupuncture points or as a standalone treatment. 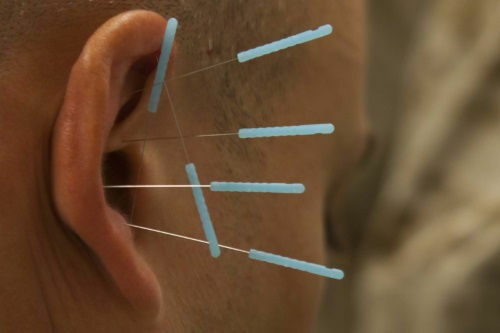 It is a great way for those patients who have a phobia to needles to still enjoy the benefits of acupuncture care, as auricular therapy can be performed with very low current electric or laser stimulation that is rarely felt by the patient. A technique of stimulating acupuncture points with the suction of a bamboo or glass cup or plastic cup. In a typical cupping session, glass cups are warmed using a cotton ball or other flammable substance, which is soaked in alcohol, let, then placed inside the cup. Burning a substance inside the cup removes all the oxygen, which creates a vacuum. As the substance burns, the cup is turned upside-down so that the practitioner can place the cup over a specific area. The vacuum created by the lack of oxygen anchors the cup to the skin and pulls it upward on the inside of the glass as the air inside the jar cools. Drawing up the skin is believed to open the skin's pores, which helps to stimulate the flow of blood, balances and realigns the flow of qi, breaks up obstructions, and creates an avenue for toxins to be drawn out of the body. Depending on the condition being treated, the cups will be left in place from 5 to 10 minutes. Several cups may be placed on a patient's body at the same time. Some practitioners will also apply small amounts of medicated oils or herbal oils to the skin just before the cupping procedure, which lets them move the cups up and down particular acupoints or meridians after they have been applied. In China, cupping is used primarily to treat respiratory conditions such as bronchitis, asthma, and congestion; arthritis; gastrointestinal disorders; and certain types of pain. Some practitioners also use cupping to treat depression and reduce swelling. Fleshy sites on the body, such as the back and stomach (and, to a lesser extent, the arms and legs), are the preferred sites for treatment. While cupping is considered safe it can cause some swelling and bruising on the skin. As the skin under a cup is drawn up, the blood vessels at the surface of the skin expand. This may result in small, circular bruises on the areas where the cups were applied. These bruises are usually painless, however, and disappear within a few days of treatment. In addition, there are several instances where cupping should not be performed. Patients with inflamed skin; cases of high fever or convulsions; and patients who bleed easily, are not suitable candidates for cupping. Pregnant women should not have cupping on their stomach or lower back. If the cups are being moved, they should not cross bony areas, such as the ridges of the spine or the shoulder blades. Moxibustion can be used in conjunction with acupuncture. It consists of burning a herb called mugwort on or near acupuncture points. It is a treatment proven to turn breech babies. There are two types of moxibustion: direct and indirect. In direct moxibustion, a small, cone-shaped amount of moxa is placed on top of an acupuncture point and burned. This type of moxibustion is further categorized into two types: scarring and non-scarring. With scarring moxibustion, the moxa is placed on a point, ignited, and allowed to remain onto the point until it burns out completely. This may lead to localized scarring, blisters and scarring after healing. With non-scarring moxibustion, the moxa is placed on the point and lit, but is extinguished or removed before it burns the skin. Indirect moxibustion is currently the more popular form of care because there is a much lower risk of pain or burning. In indirect moxibustion, a practitioner lights one end of a moxa stick, roughly the shape and size of a cigar, and holds it close to the area being treated for several minutes until the area turns red. Another form of indirect moxibustion uses both acupuncture needles and moxa. A needle is inserted into an acupoint and retained. The tip of the needle is then wrapped in moxa and ignited, generating heat to the point and the surrounding area. After the desired effect is achieved, the moxa is extinguished, and the needle(s) removed. In traditional Chinese medicine, moxibustion is used on people who have a cold or stagnant condition. The burning of moxa is believed to expel cold and warm the meridians, which leads to smoother flow of blood and qi. In Western medicine, moxibustion has successfully been used to turn breech babies into a normal head-down position prior to childbirth. A landmark study published in the Journal of the American Medical Association in 1998 found that up to 75% of women suffering from breech presentations before childbirth had foetuses that rotated to the normal position after receiving moxibustion at an acupuncture point on the Bladder meridian. Other studies have shown that moxibustion increases the movement of the foetus in pregnant women and may reduce the symptoms of menstrual cramps when used in conjunction with traditional acupuncture. Mugwort, also known as artemisia vulgaris or ai ye in Chinese, has a long history of use in folk medicine. Research has shown that it acts as an emmenagogue - that is, an agent that increases blood circulation to the pelvic area and uterus and stimulates menstruation. This could explain its use in treating breech births and menstrual cramps. On its own, acupuncture can be seen as an alternative way of treating fertility problems. It is also often seen as a complementary therapy to modern fertility treatments. When used alone, though, acupuncture is probably most elective for those couples who are experiencing a functional problem, like irregular ovulation, rather than a structural problem, like a blockage in the sperm ducts. Some practitioners will also recommend Chinese herbs for infertility that will supplement the acupuncture and any other treatment you may be receiving. If you take herbs while receiving other medical treatments, be sure to tell your doctor. Some herbs can interfere with the function of fertility drugs and procedures. Why acupuncture works for infertility problems is still debatable. However, most practicing acupuncturists say that acupuncture helps by regulating your body's system. This aids in blood flow to the reproductive organs and stabilizes hormone levels. This in turn will increase ovarian function in women as well as sperm production in men. Used as a complementary form of therapy for women undergoing other fertility treatments, acupuncture has been proven to be especially beneficial. Some believe that acupuncture works by helping women stay more relaxed through stressful fertility treatments. Studies have shown that acupuncture increases the rate of pregnancy in women undergoing in vitro fertilization (IVF). A German study done in 2002 showed that of the 80 women who underwent IVF and received acupuncture, 34 women got pregnant, a success rate of 42.5%. Of the 80 women involved in the study who received IVF without any acupuncture treatments, only 21 women (26.3%) became pregnant. More recently, an American study involving 114 women showed that 51% of the women who had acupuncture and IVF treatments became pregnant versus only 36% of the women who had IVF alone. Deeper analysis of this study revealed that, while 8% of the women in the acupuncture group miscarried, the rate of miscarriage in the IVF-only group was 20%. Furthermore, women who received acupuncture also had lower rates of ectopic pregnancies. Up until recently Cosmetic Acupuncture had remained one of the best kept secrets of Hollywood's rich and famous. This has recently changed with celebrities such as Madonna, Prince William, Cher, Angelina Jolie, Claudia Schiffer and Gwyneth Paltrow coming forward as spokesmen for the effectiveness of Cosmetic Acupuncture. Specialist clinics now exist in Ireland and the UK devoted exclusively to acupuncture facial rejuvenation. What can I expect during a treatment & how many treatments will I need? Your treatment will begin with a complete Chinese medicine diagnosis and a discussion about what areas of your face you wish to focus on. Very fine needles are then placed in points on your face and body. Your treatment also includes facial massage, using special massage techniques applied to various areas of the face, especially at key acupressure points. Facial rejuvenation acupuncture works best with completion of 12 treatments which can be given once or twice a week, with the effects being noticed usually by the seventh session. However, all people respond differently. Much depends on their condition and lifestyle prior to and during treatment. Remember, it took decades of stress, sun damage and exposure to environmental toxins for your skin to reach a state of crisis, and the damage will not be instantly undone. Facial rejuvenation acupuncture can help you look and feel younger by slowing down the aging process.